I know this is a little late but since I am still writing 2009 on things accidentally, I figured it was a sign that it was still ok to write about this! In 2009- I focused most of my recreation time on running: Soldier Field 10 mi race, Bank of American Chicago Marathon, Chicago Half Marathon, Rock and Roll Chicago Half Marathon, Rock and Roll Las Vegas Half Marathon, Chicago Woman's 10k, Pumpkins in the Park 5k. I realized that most of my my fun food this year was with Steve and other friends post race or after a Saturday morning long run. With getting up every Saturday morning at 5:30 AM to run, I usually spent my Friday nights cooking pasta at home rather than going out. My list seems to have more burgers, ice cream and cased meat than usual! 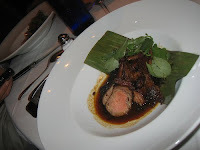 So here's a top 10 list of the best things I ate in Chicago in 2009! * indicates running was involved. Ok, this wasn't the best food ever but this was pretty cool. Each year, Wrigleyville Neighbors holds a lottery to allow a group of people onto the field for a tour and lunch. It's sort of a "thanks for letting us screw up your traffic 81 days per year" gift. Stella's is an old fashioned diner with a little updated feel. It's practically across the street from me. We went here with friends after the Chicago Half Marathon. This place has huge and delicious milkshakes, as well as great burgers and other diner foods. Eating an entire huge milkshake is a rare treat for me. If you haven't tried hot pot before, you're missing out! 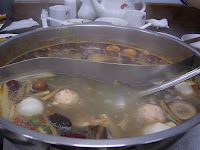 You drop in every imaginable vegetable, meat, noodles, tofu, meatballs...etc into a huge boiling pot of spicy or mild broth and then fish it out when it's cooked. I stayed away from the tripe (not my thing) but this is an incredibly fun dish to enjoy on a cold evening with friends. Photo courtesy of flickr user alvxyz. This year the tart frozen yogurt grew in popularity in Chicago. I have searched far and wide for the best frozen yogurt but it was under my nose all along on State and Erie. My favorite combo: original flavor with blueberries, raspberries, and fruity pebbles. I finally made it to the ubiquitous late night junk food spot- the Weiner's Circle. Famous for it's foul-mouthed, back-talking staff, we went in the daytime and found only curtious and hard working folks and delicious char-grilled goodness after the Soldier Field 10 mi race. 5. Rockit Burger- This is my favorite burger in Chicago. I had it twice in 2009! Pretzel bun, roasted fig spread, brie cheese, Wagyu beef, truffled fries on the side- totally worth $20. 4. Bobtail peppermint stick ice cream w/hot fudge- This is the best ice cream known to man. This year, I had this combo instead of birthday cake. This ice cream shop has a knack for the right amount of peppermint flavor and puts in huge chunks of peppermint candy. Another fantastic flavor is their chocolate chip merlot. It has a very mild merlot flavor with thin dark chocolate shavings and a touch of salt. Delish! 3. Tomahawk chop ribeye steak@ Rosebud Steakhouse- This is one of the classic Chicago Steakhouses. We had clams casino, martinis, table size caesar salad, creamed spinach, and thsi Flintstone-size steak. The tomahawk chop is a french-style bone in ribeye steak. A very "Chicago" cut. There are lots of fabulous steakhouses in Chicago. Maybe I will get to try out some more in 2010, such as Gene & Georgetti's or Tramanto's Steakhouse. 2. Eggplant stuffed dates at Green Zebra- This is my favorite Chicago restaurant. We went here for the first time in 2008. When we went back, I have to say, I was afraid that I would be disappointed because it wasn't as good as I remembered. Thankfully, it knocked my sock off again. This dish in particularly was amazing. Salty eggplant wrapped around medjool dates was a vegan version of chorizo or bacon wrapped dates. A creamy coconut custard and tabbouleh pilaf on the size created a perfect balance of flavor and texture. At this restaurant, vegetables take the main stage in a way I have never experienced before.